July 6, 2014 – Bluefish as the Fisherman’s Flag: Bandiera alla Marinara. There was a good bit of slicing and dicing involved in the prep for this dish, but it wasn’t too hard, as the recipe make things pretty clear. I did deviate a bit for two ingredients: the Gaeta olives and the tomatoes. I pitted the olives, even though the recipe doesn’t specifically say to; I just thought it would be nicer not to have to spit out olive pits at the dinner table. This probably took more time than it was worth – plus I missed one! – so I’ll skip this step next time. I did save a little time by not peeling the tomatoes. It seemed like a lot of work, plus I figured a few tomato peels weren’t going to make or break the dish. I also didn’t “coarsely chop” the tomatoes because this seemed like it would make a huge mess. Instead, I did what I always do when I have to chop plum tomatoes. First, I use a serrated knife to cut off the top of the tomato and then cut it in half lengthwise. I next lay each half cut side down on a cutting board. (See the photo on the left below.) Then, using the same knife, I make four cuts down the length of the tomato and about five or six cuts across. The result is about two dozen neat, about even-sized pieces (see the photo on the right below), which are much easier to work with. I also took another small shortcut in assembling the ingredients. If you watch any cooking show, they almost always have each ingredient ready to go (sliced, chopped, measured out) in its own bowl. This looks beautiful and is great if you have a lot of room to work with. Since we don’t, what we usually do is put all the ingredients that go into a dish at the same time in the same bowl. This not only saves space, but also saves time, because you can pour a lot of ingredients in at once. This approach works really well for this recipe, because the non-fish ingredients basically get added in two batches. The prep was simple, but I got off to a bad start with the cooking. Instead of using a saute pan, as the recipe instructs, I used our Dutch oven. The potatoes immediately started sticking to the bottom of the Dutch oven and began to make quite a mess. I switched things up mid stream and moved everything to a non-stick pan, which totally solved the problem. After that, it was pretty simple and I followed the recipe to a successful conclusion. The fish was firm and not at all dried out. 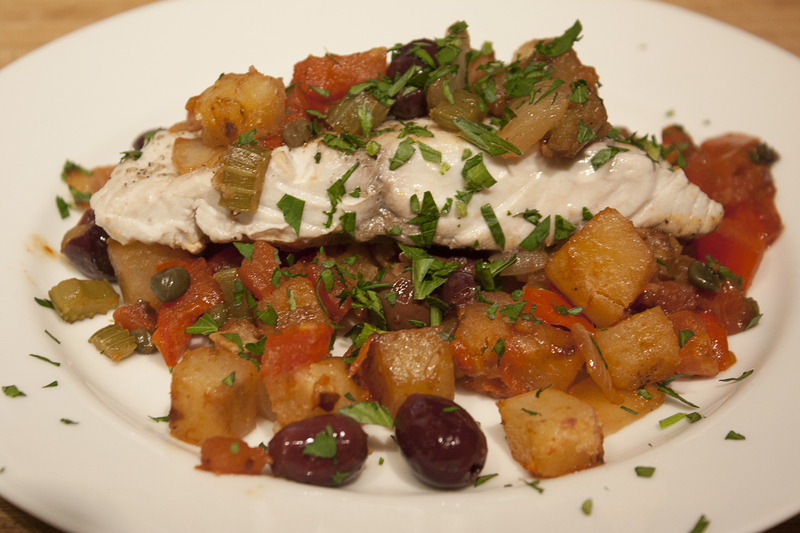 The other ingredients came together really well and gave a nice mix of flavors, especially the capers and olives. The small amount of potato made the dish a little more filling without making it heavy. We paired this up with a white wine from Sardinia for a nice Sunday dinner.